California took another major and symbolic step today with its decision to rely significantly on energy efficiency and other clean energy resources to help replace electricity once generated by the San Onofre Nuclear Generation Station (SONGS) serving San Diego and the greater Los Angeles area. 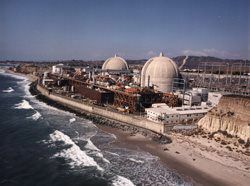 The California Public Utilities Commission (CPUC) today made official its strategy to address the loss of the huge nuclear plant, which had been offline since January 2012 and was officially retired last year. Fortunately, it closely resembles its proposal released last month. The final plan uses efficiency and other “preferred resources”—those resources with lower environmental impacts—like demand response (ways customers can consume less energy at key times during the day) and renewable energy such as wind and solar, as well as some upgrades to the electric system, to replace the vast majority of the lost SONGS generation. Instead of turning directly to dirty gas-fired power to replace SONGS, this decision fills the gap left by SONGS with at least two-thirds of clean energy resources, and up to 100% clean energy. That means that dirty gas-fired power is limited to contributing, at most, one-third of the replacement energy, and at best, zero. Today’s groundbreaking step puts California on a better course for the long term, avoiding a significant number of fossil-fueled power plants, and those power plants' emissions that Californians are all too familiar with. As the state gears up for the summer strain on the grid this year, two of California’s largest metropolitan areas -- Los Angeles and San Diego -- begin to dread their often daily dose of smog and its related quality-of-life and even medical issues. We applaud the commission for moving in the right direction and, especially for its significant reliance on the contribution of “preferred resources”—resources that are critical to the health and well-being of Californians. In addition, it’s notable that the commission authorized no additional mandatory gas-fired power sources (which create emissions) because previously, the commission did enact mandatory gas requirements in its 2013 decision. This frees the utilities to appreciably, if not entirely, rely on clean energy resources to replace SONGS. California has embraced efficiency – getting the same or more work from less electricity – as the cleanest, simplest and most cost-effective energy resource. Not only does efficiency lead to lower utility bills, it reduces the amount of electricity that must be generated from dirty energy that pollutes our air and harms our health. The fear had been that the replacement of SONGS, a mammoth 2,200-megawatt power plant (equivalent to about four regular large-sized power plants) around which much of the California transmission grid was built, and which left an over 2,500 MW hole in the grid (due in part to its electrical location and characteristics), would be met with the least creative response—the excessive use of more fossil-fueled power plants. In June 2012, for example, a retired 50-year-old gas-fired generator at Huntington Beach was brought online to help address the loss of SONGS, but not so much for energy but rather to maintain voltage levels—a complex demand-and-supply balancing act. Fortunately, with this long term decision, the state is definitively not going to make excessive reliance on gas-fired power plants its long term solution. Rely on the supply of energy from what amounts to two medium-sized fossil-fuel power plants (600 megawatts of power) from “preferred sources”—those that have lower environmental impacts and lower public health costs—like efficiency, reducing energy consumption at peak times, wind, solar, and energy storage. Use 400-900 megawatts of power from new resources, meaning any type of energy resource as needed. This historically has meant gas-fired power generation because many preferred resources were competing on a non-level playing field, but new language requests more fairness in competition for cleaner sources such as efficiency, demand response, solar, and wind. These sources will account for between 1,000 and 1,500 megawatts of power to replace the over 2,500 megawatt hole in the grid left by SONGS. Fortunately, the remainder is made up by additional solutions that are not fossil-fueled power plants, such as reducing the demand through energy efficiency and making improvements to transmission networks. This diverse portfolio of resources will meet the extensive voltage support, energy, and power needs that were originally provided by SONGS. As a result, today’s move is good news for Californians and the air we breathe. While the plan is well-balanced, NRDC is concerned that the plan failed to explicitly rely on all reasonably-expected-to-occur energy efficiency. As NRDC demonstrated in the proceeding, the model results that used the best resource estimates available showed there was no clear need to authorize any additional gas-fired generation at this time (beyond the 1,500 MW of gas-fired generation already authorized in 2013) to replace SONGS. These estimates explicitly rely on a conservative 733 MW of savings from building efficiency standards, appliance efficiency standards, and utility efficiency programs. We know the efficiency estimates should have been even higher – because the 733 MW estimate didn’t account for the recently-adopted federal appliance efficiency standards, like efficiency standards for microwaves and commercial refrigerators. The plan also underestimated other preferred resources and transmission solutions, discounting those resources by up to 90%. We called for improving the accounting of these preferred resources because an assumption that their contributions are only worth 10% was not backed by the record. While it has its shortcomings, today’s replacement strategy significantly avoids the construction of many fossil-fueled power plants and is a critical step forward for California’s clean energy future. For Californians within the greater Los Angeles region and in San Diego region, their health and environment will be directly affected by today’s decision. And for the entire state of California, this decision will have a major impact on future long term energy planning because it demonstrates that we can replace an enormous nuclear power plant with largely clean energy and transmission solutions.